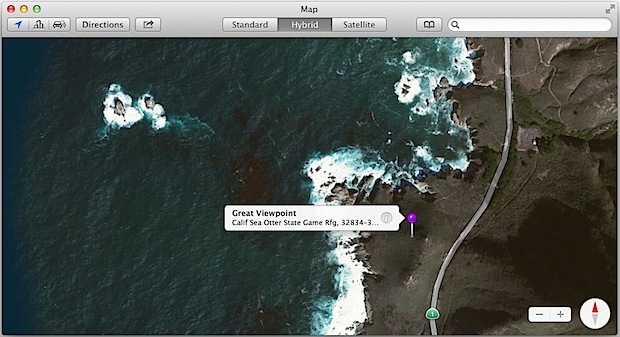 The Maps app in Mac OS X makes it simple to share locations with others, even if the location isn’t defined and just in the middle of nowhere. This is a great trick for many reasons, whether to share a nice spot you found in the city, share with your partner where you left the car at the airport, to send a friend to a great little taco cart, share the secret free parking spots off of Market Street, the location of a great viewpoint with amazing sunsets, a Geocache location, or whatever and where ever else. Sharing locations initially works just slightly differently if it’s a labeled spot (i.e. already defined on a map) versus an unlabeled spot (i.e. that interesting old barn off the side of highway 1 in the middle of nowhere), but sharing the location is the same either way. The send Maps to iPhone option is instant, whereas the Email option launches the default mail client, Messages goes through the Mac messaging client, and the social sharing options go to their respective service like Twitter or Facebook through the web. 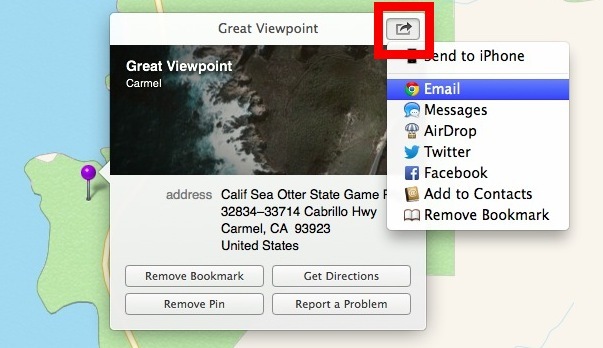 Once the pinned spot has been sent, it can be opened either on another Mac in the Maps app, or on any iOS device through the Maps app too. If it’s saved to an iPhone, it can then be referenced in the future as a destination through Siri’s turn-by-turn navigation directions. Of course, this trick can also go the other way as well, and users on an iPhone or iPad can also pinpoint a location on a map and send or share it with others too. This is obviously useful for directions and normal mapping usage, but photography fans in particular may find this to be an extra great tool, because it makes sharing precise spots of their favorite shooting locations extremely easy. Have fun out there! That is a great trick, and you can actually do the same thing with Google Maps on the web (or on the iPhone app). I opt for the Google Maps route because it allows for offline caching, hugely important if you’re going to be out of a service area for activities like geocaching as you mention, or for backcountry skiing. I know some outfitters who use this instead of a regular old GPS to keep track of great fly fishing spots and share the goods among staff too. 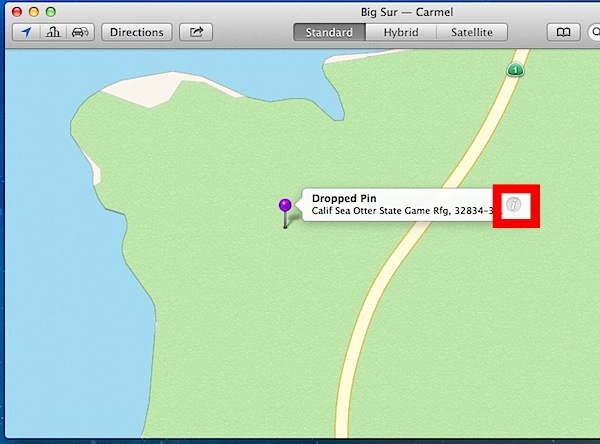 You guys wrote about the Google offline maps cache trick here http://osxdaily.com/2013/07/17/use-google-maps-offline-download-maps-cache/ and I use it very often. Too bad it’s hidden, it’s amazing. The question is, why doesn’t Apple Maps do caching yet? Seems like a no brainer, right? I can’t say I’m a fan of Apple Maps, I prefer to use the free app I got years ago called Where Did I Park My Car. Works v. well.